You can search, sort, and view your contacts by first or last name. 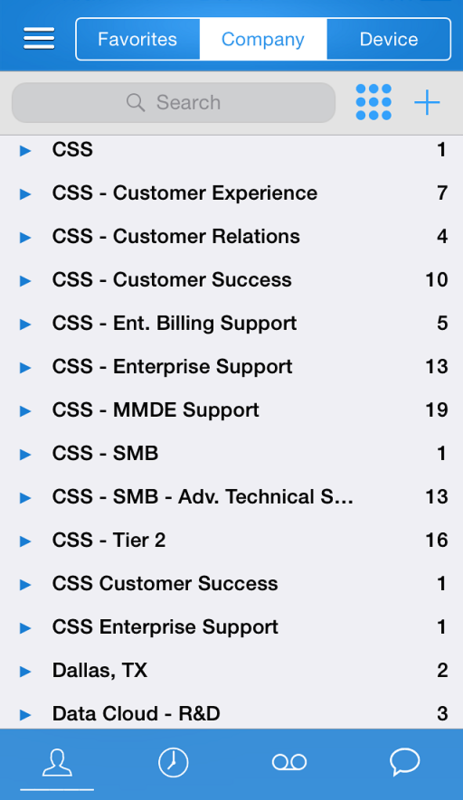 You can also search for contacts by job title, department, or location. 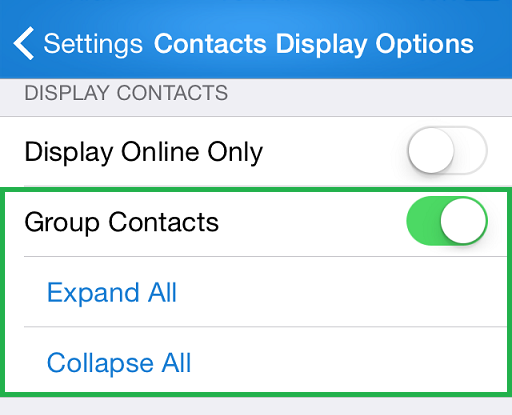 From the main menu, go to Settings > Contacts Display Options. Select your sorting and viewing preferences. For example, sort contacts by first name in alphabetical order, and show only online contacts. 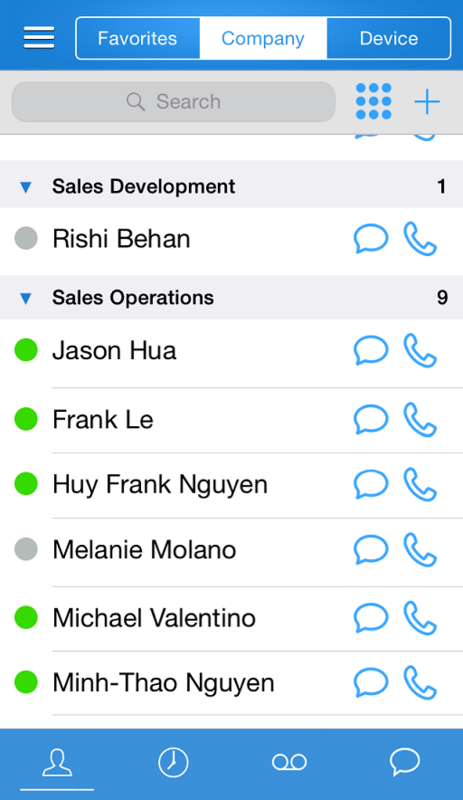 Grouping contacts based on category helps you locate contacts quickly. If contacts are grouped, you can expand or collapse the desired contact groups as needed. Group Contacts: Groups company and personal contacts by tags such as their department or location. By default, the option is disabled, displaying company and personal contacts as a flat file. Expand All: Shows all the contacts and the top groups. Collapse All: Hides the contacts details and shows the groups only. Note: Grouping options are not available for personal contacts under Device. They are only available for Company and Favorites contacts. How do I group contacts? Group Contacts. The filtering options are enabled automatically. Select Expand All to show all the contacts and their top groups. Select Collapse All to show the groups only and hide the contacts. You can tap to expand any group. Note: You must enable at least one filter to view the desired contacts. You can filter your contact list by department, location, and more. 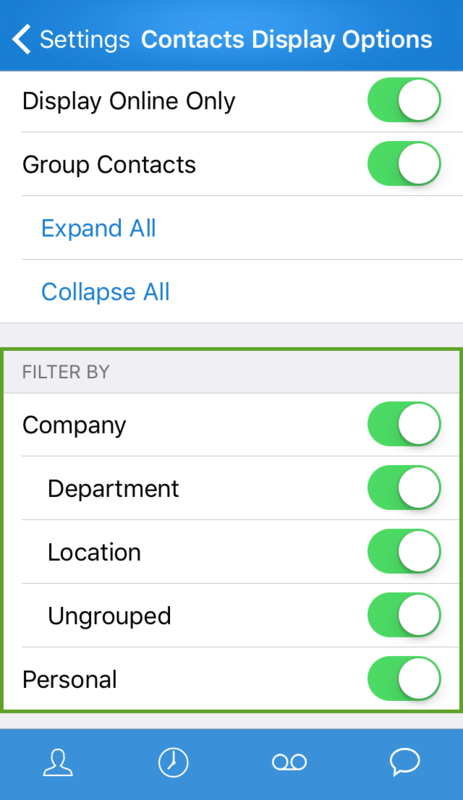 Enabling a filter allows you to see the filter's contact category, and disabling the filter hides the contact category from your contact list. Company: Shows or hides contacts in your company. To view sub-filters, you must enable Group Contacts. Personal: Shows or hides personal contacts you have created using Virtual Office. Enable or disable any filtering options under Filter By. Open Contacts to see the changes.